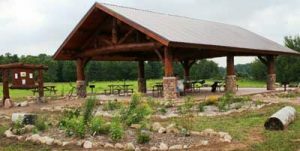 Anderson Park in Isanti County is an almost perfect example of what can be accomplished when a family, a government body and a group of willing and active volunteers come together. In 2007, the Anderson family began talking to Isanti County about selling their 174-acre farm to the county. Lee Kingsbury and some of her neighbors heard about the possible sale and knew that if they wanted to have a voice in what happened with the beautiful natural area, they needed to form a Friends Group. Two community meetings later, the group had lots of ideas, a few donations, volunteers for a planning committee and plenty of enthusiasm—and literal muscle—to make things happen. “Our mission was to preserve the natural beauty of the area,” said Kingsbury. The park sits in the southeast corner of the county, an area with a great diversity of flora and fauna. The park includes restored prairie, woods, marshes and over a half mile of frontage on two small lakes. The Friends Group wanted to help in the creation of a park, its members also wanted that park to stay natural. Today, just seven years after the land was sold to Isanti County, the park has several added amenities that maintain the idea of a place to view wildlife, to walk in tranquility and to see Minnesota’s geological and topological history. The Friends of Anderson Park decided that the first thing it wanted to help accomplish was to build a picnic shelter, Kingsbury said, “because it would be a real structure, something that people could use.” A picnic structure would help identify the area as a park. As has been typical for the group, the picnic structure started and finished with lots of people pitching in. A member of the group knew a log builder who offered to help construct the shelter, if the logs were purchased from him. Those two men, plus a group of retirees who called themselves the AARP Crew, built the shelter. The Friends Group raised several $1,000, then asked the township for a grant of $5,000. “Then I went to the Isanti County Board and told them we needed $24,000 from them—for a $78,000 project,” Kingsbury said. The picnic structure is made of huge logs and looks like it belongs in a natural area. Prairie and rain gardens have been planted around it. Between the shelter and a nearby lake is a natural children’s play area, with play structures made from tree trunks, branches, culverts and sand. Kids can and do create teepees, houses, make-believe campfires and anything else their imaginations come up with. Three boardwalks, one of them 950 feet long, allow visitors to walk through what otherwise might be marshy areas without damaging the terrain—or their footwear. The longest boardwalk has Horse Leg Lake on one side and a wetland on the other, with a big viewing platform in the middle. The Friends Group helped raise the grant money to create the boardwalks. Anderson Park has become known to birders for its rich variety of birds, from sandhill cranes to common loons to red-shouldered hawks. The Friends have partnered with the Isanti County Parks Department, the Minnesota Audubon Society and Wild River Audubon Chapter to build a chimney swift tower, hoping to attract hundreds of swifts, a declining species, and to put up purple martin nest boxes in a number of sites in the park. Parks & Trails Council of Minnesota (P&TC) is the fiscal sponsor for Friends of Anderson Park, a role we fill for a number of Friends Groups. The Friends Group suggested that Wendorf contact P&TC to help acquire the land and hold it in trust so the county would have time to raise money. P&TC is currently negotiating with one landowner and will soon be doing appraisals and surveys on the other possible acquisitions, while the Friends Group is raising money to use as matching funds for grants. The adjacent properties would grow the park from 174 acres to roughly 280 acres and add a mile of lakeshore.